We finally made it out of Guangzhou, had an uneventful but comfortable flight from there to Bangkok, and successfully made it to the Lamphu Tree House Hotel where we had reservations for the first night. Even though we had been in transit for over 24 hours, and had only slept for a few hour increments on the planes, we didn’t want to waste our first night in Thailand. 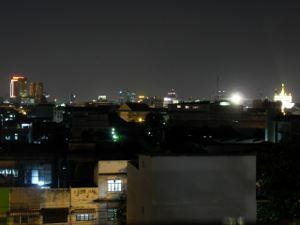 The hotel was really nice and had a lovely rooftop patio, but we really were itching to get out into Bangkok. The hotel was supposedly a 10 minute walk from Khao San Road, and knowing that it has been called the Backpacker Center of the Universe, we figured what better place to go for our first few hours in Thailand. After about an hour decompressing in the hotel, a quick shower, some water to re-energize after so much time spent in the airplanes, and we pulled out a city map and tried to figure out how to get there, and in a few minutes we were ready to go for our first view of Khao San Road. Out of the hotel, along and then over the canal, down the street, a right turn, a missed right turn, double back, and finally we were there. It was still early by Khao San standards, so we walked a bit and then settled down at a street front restaurant where we could people watch but not be blasted out by the music coming from inside. We tried to get a couple big bottles of Singha and some curry and pad thai, but somehow the server pushed a couple Heinekens on us. Who knows what really happened, we couldn’t understand her and she couldn’t understand us, but she was wearing a skin tight dress with a Heineken label stretched around the front, so it seems fair to say that she was getting paid to promote Heineken. No worries though, we managed to get some official Thai beers for the next round. After so much travel, a few beers knocked us out quickly, so we wrapped the evening up early. I was actually quite surprised how tame Khao San was, but it was still early, so we probably saw the PG rated version. But the rest of it lived up to what I had heard – plenty of watering holes, dance clubs, street vendors, guesthouses, ladyboys, tourist shopping and everything else you would expect. Surprisingly (or I guess not so much), it wasn’t as cheap as I figured it would be. Though with all the tourists moving through, I’m sure the prices have risen over the years. One other thing to note is that we learned quickly to keep our eyes open while walking around Bangkok. In addition to the traffic and the tuk tuks, you never know where a stone might be missing in the sidewalk or when a power line might be hanging at eye level. I had several close calls of nearly tripping over things on the ground and with low hanging power lines and low hung store awnings that are at the perfect height to poke you right between the eyes. Don’t walk around on autopilot! Back at the hotel we got to sleep quickly, probably before our heads even hit the pillows. The plan for the next day was to catch a night train down to Surat Thani where we could then make the hop over to Koh Phangan for the infamous New Years Full Moon Party. We had pre-booked sleeper tickets on the train with a company called Traveller2000, and I would highly recommend them. Even though you can book directly through the railway, if you want a prompt response you will be forced to pay a few extra dollars for a private agency, but this particular company had very response customer service. They even deliver the tickets right to your hotel, provided you are in the city. So anyway, we had to be to the station the next night around 7, so we had all of the next day to explore more in Bangkok. As evening approached, we wandered back to the hotel to pick up our bags, and then headed out to try to get a cab to the Hualompong Train Station. I had estimated that it was only a few miles away and wouldn’t take very long, but that turned out to be a huge mistake. It was Monday night, and unbeknownst to me traffic in Bangkok pretty much comes to a standstill at that time. We had two taxi drivers turn us down, and another laugh and tell us it would take about an hour to get to the station. It seemed crazy, but for over 10 minutes we stood there trying to figure out a plan of attack, and none of the traffic even moved an inch. I was beginning to think we were screwed, but then we decided to go for a Tuk Tuk. In case you don’t know what that is, it’s basically a 3 wheeled motorcycle but with a bench seat in the back so a few people can fix. The are somewhat dangerous since you are virtually unprotected from the the outside world in the case of an accident, but we decided to go for it since they can navigate traffic better. We were in a bit of a predicament, and not knowing exactly how far we were from the station and time ticking we didn’t really have any bargaining power. So we agreed to an over inflated price, and hopped in clutching our bags and holding on tight. The traffic was terrible, but as we thought, the driver got us there with time to spare. We probably could have made it in a proper cab, but I am sure that the Tuk Tuk was by far quicker. So there we were, at the station, ready to head to the island of Koh Phangan for 5 days! Originally posted on Sunday, February 21st, 2010 at 12:26 PM	. Where to stay at Khaosan Road -Bangkok? 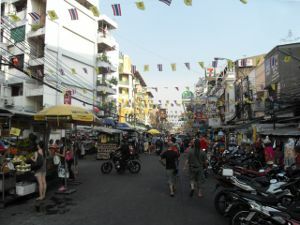 Me and my friend are planning to go to Bangkok on July 14 2012 and we want to stay at Khaosan road for a night. any idea where to stay?cheap and clean, best location ….noisy won’t be a matter for us. I’m afraid I don’t have any good suggestions there. We did not stay on Khao San, we stayed at a place called Lamphu Guesthouse which was great, clean, moderately priced and quite quiet, but a 15 minute walk from Khao San. Let me know where you end up staying!